Air New Zealand has several flights per week from Auckland, New Zealand to Rarotonga, Cook Islands or see your travel agent for other carriers. 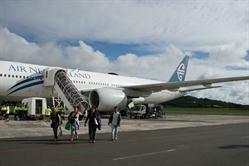 Air Rarotonga has several flights daily. Please click their logo below for a link to book flights. Please note check in is 1pm and check out is 10am following day.